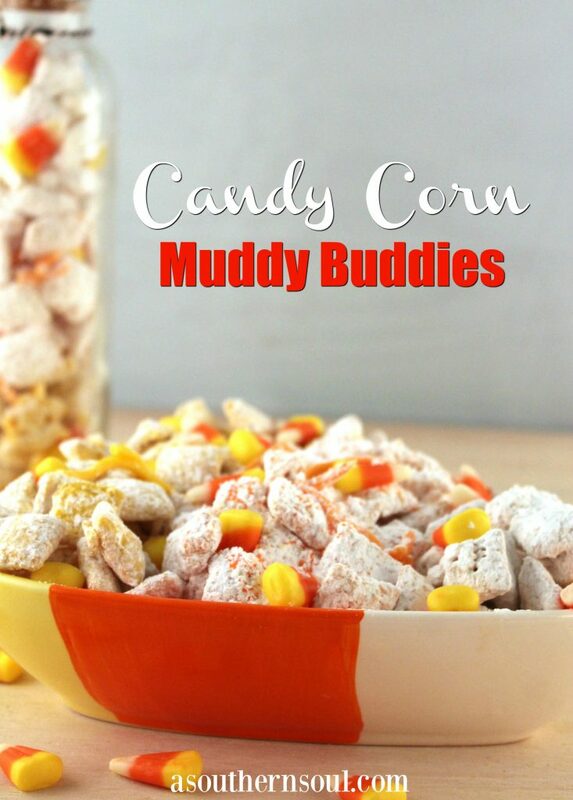 Candy corn and sprinkles add a new twist to the childhood classic snack called Muddy Buddies! 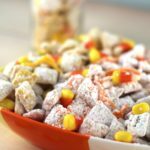 You might actually know this sweet, crunchy treat by another name, Puppy Chow, but what ever you call it, it’s yummy and just down right fun to eat. Fall is here and I couldn’t be happier. I’m ready for “Friday Night Lights” on the football field, cozy sweaters, comfort food and “chilling” at home watching movies. Whether we are on the go or at home, you know I’ve got to have snacks for my people! 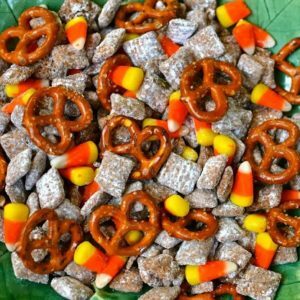 It’s been an unspoken tradition that every fall, I make some sort of sweet, salty, snack mix and this year is no different. 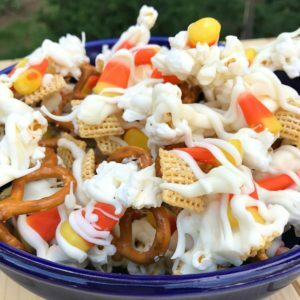 Mr. A Southern Soul has come to expect a special treat and this one will definitely satisfy his sweet tooth.I came up with a sweet twist on a classic recipe that’s just downright addictive! 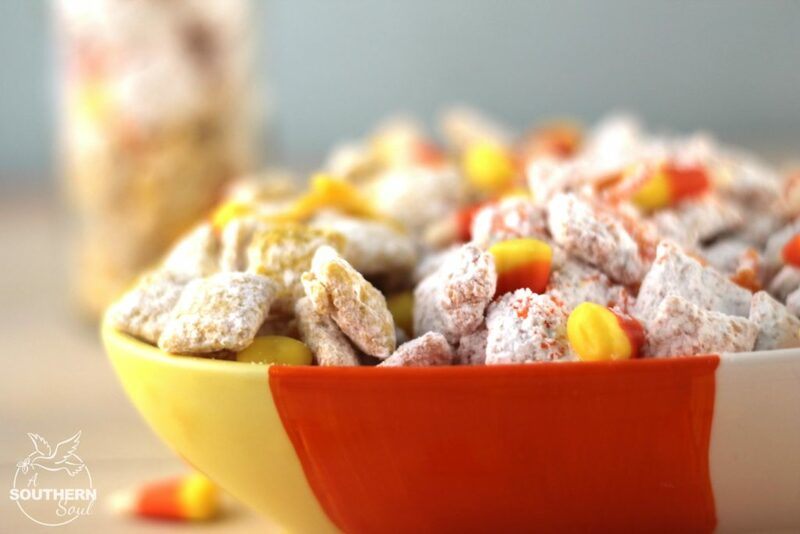 I combined Chex cereal with creamy, candy melts, powered sugar along with just the right amount of sprinkles then added candy corn for a fun treat. 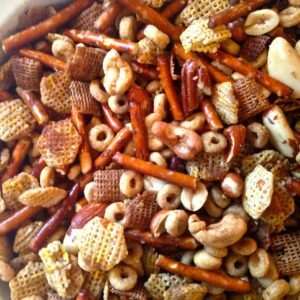 It’s a great take along snack for a road trip or to enjoy while watching your favorite team play. For me, I like munching on a handful while watching my fav Netflix show or movie. 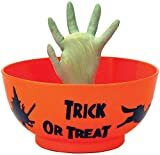 I’ve even shared some with our neighbors as a surprise treat! So, here’s to fall and tradition! 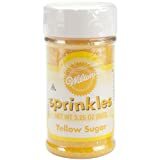 Place 1/4 cup of powdered sugar in a gallon ziplock bag and add 1 tablespoon of Yellow sugar sparkles. Mix well. 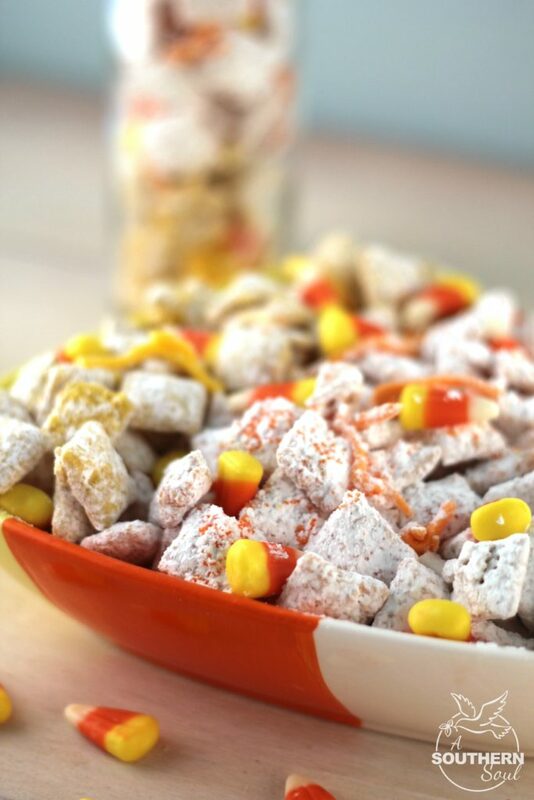 Remove candy coated Chex cereal from bowl and put into gallon ziplock bag with powdered sugar and Yellow sugar sparkles. Seal the bag and shake well. 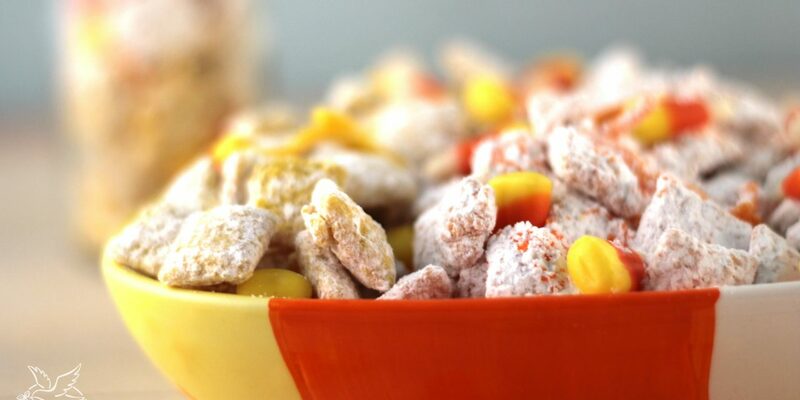 All candy-coated cereal needs to be covered. 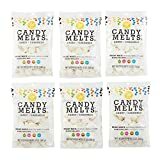 Repeat steps 1-5 with Orange Candy Melts. Repeat steps 1-5 for the white EXCEPT, leave out step 5. 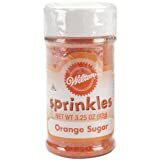 You do not want Yellow or Orange sugar on the white pieces! 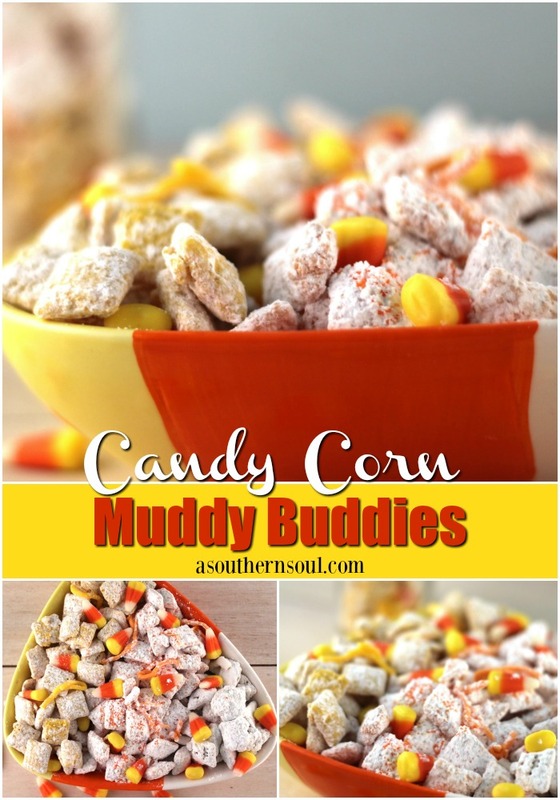 Allow the muddy buddies to dry completely before combining. 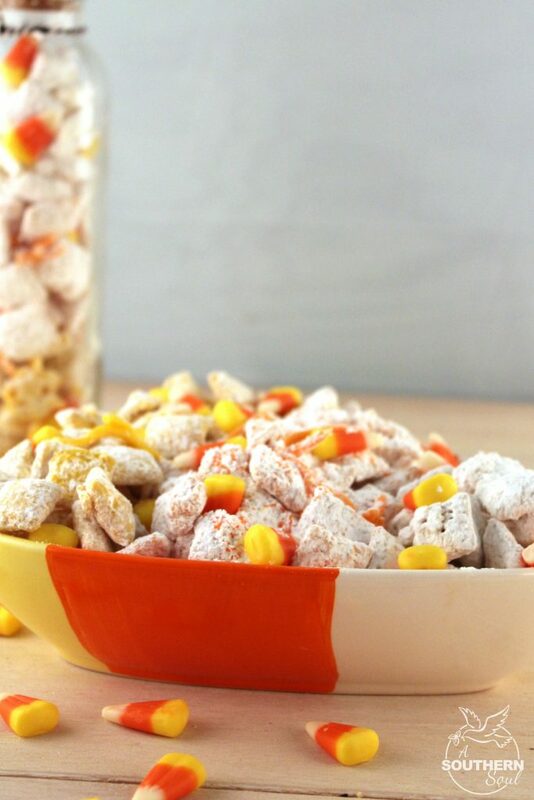 Add embellishments (Candy Corn peices) if desired. 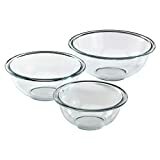 **Store in an airtight container. Approximately 16, half cup servings. 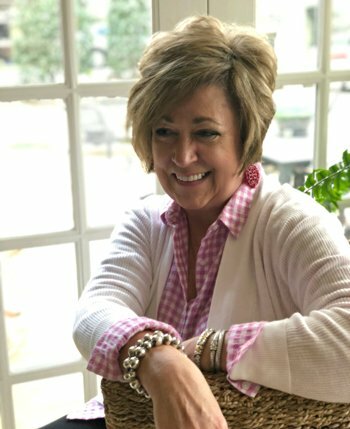 Follow A Southern Soul on Pinterest!